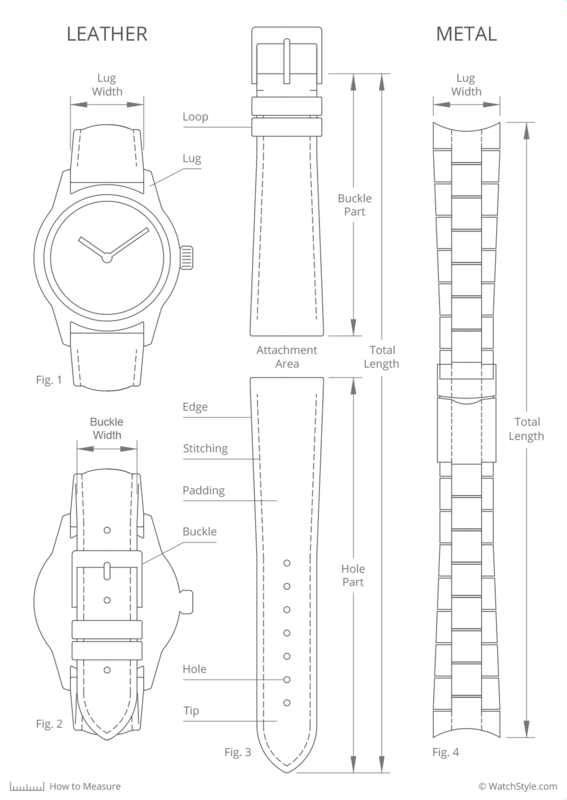 Determining the appropriate size of a watch band is pretty easy. Suffice to measure the width and the length of your current watch band using a metric ruler or a tape measure. If it's a leather band, you may also check the reverse side: the lug width is often imprinted into the lining. For higher accuracy, however, we recommend measuring both the clear width between the lugs (Fig. 1) and the clear width inside the buckle (Fig. 2) using a digital caliper. When measuring the length of your current leather watch strap (Fig. 3), be sure to measure the hole part and the buckle part without the actual buckle. The hole part, minus the distance between middle hole and band tip, plus the buckle part, plus the watch case diameter, should be equal to your wrist circumference. In order to determine the appropriate length of a metal bracelet (Fig. 4), first measure your wrist circumference with a metric tape measure, then subtract the watch case diameter from it. Another procedure would be to remove your current metal bracelet from the watch case, and to measure its total length in a flat position. The above mentioned lengths apply to the watch straps of the Hirsch Precious, Sport and Classic collections. The specifications of other collections may differ. Please also note the size charts on the respective product pages.